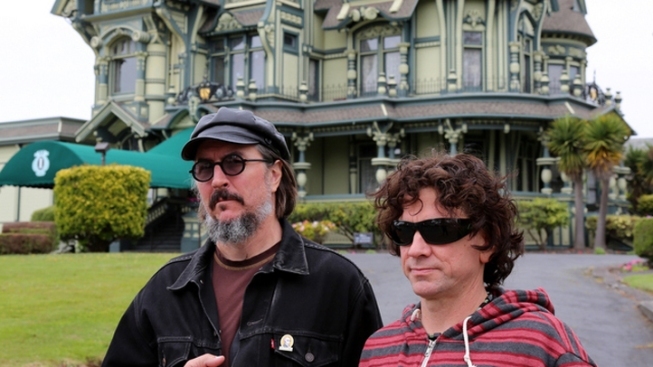 Primus singer/bassist Les Claypool (left) and guitarist Larry LaLonde, seen here in front of the Carson Mansion in Eureka, CA, have finished remixing a new stereo mix and 5.1 surround sound version of 1991's Sailing the Seas of Cheese, complete with video accompaniment. This week, a reissue of Primus’ Sailing the Seas of Cheese, one of 1991’s best alternative rock albums, gets a rerelease with a newly remixed stereo version as well as a deluxe 5.1 surround sound edit, complete with Blu-ray visual elements that vary with repeated viewings. Primus singer/bassist Les Claypool and guitarist Larry LaLonde say they had been mulling over the idea of re-mixing their sophomore studio album for a few years now, but first had to figure out where the material was to start the process. At a special listening party and moderated discussion between Claypool, LaLonde and Mike Etchart, Claypool explained how the original floppy discs that carried the mixing information from 1991 had gone missing. As a result, once they dove into the process, they basically had to remix the entire album from scratch. “You won’t miss the reverb, I promise” added LaLonde. The original album was mixed at Different Fur Studios on 19th Street in the Mission District, still an operating studio that has been around since 1968. The end result is two incredible new listening experiences: a new stereo mix, available on CD, vinyl or download, and a Dolby TrueHD 5.1 surround sound upgrade. The stereo mix comes with much richer sounds, filling the room with an even, heavy second take on the original material. The new 5.1 surround sound version comes on a DVD or Blu-ray disc where sounds travel around the room with intention, while the listener is treated to a video display reminiscent of their live shows, done by in-house video guru Agent O. To celebrate the release, Universal Music and Tamalpais Research Institute (TRI Studios) hosted a party at Grateful Dead guitarist Bob Weir’s studio in Marin with a live webcast of the moderated discussion with Claypool and LaLonde. A brief listening of the new material, compete with bank-and-forth comparison to the 1991 mix, let attendees see and hear the results from all the hard work. The 30 or so in attendance at the shindig all seemed pleased with the results. After the webcast, there was a wine and cheese party, complete with Claypool Cellars’ Fancy Pachyderm Rhone-style blend of red wine, which gave people a chance to chat up Claypool and pose for photos. A few days after the party, Primus headed out on tour, with a stop at the first full-day of the Bottle Rock Festival in Napa, and then up the coast to Eureka, Calif. where the group delighted fans living behind the Redwood Curtain with their 3D show. Fun Fact: Claypool explained the concept for the title for the album: “We were this under the radar, underground band and here we were, about to be the second release of Interscope Records with Gerardo’s ‘Rico Suave’ as their first release. The whole notion of ‘Sailing the Seas of Cheese’ was that we were either going to sink or swim.” I think we all know the outcome of that one.